Our Fundraiser ' Shadi Ka Syapa' play full of humor and fun is being staged at IIT semininar hall by a Aarambh group which is an all women group of artists. 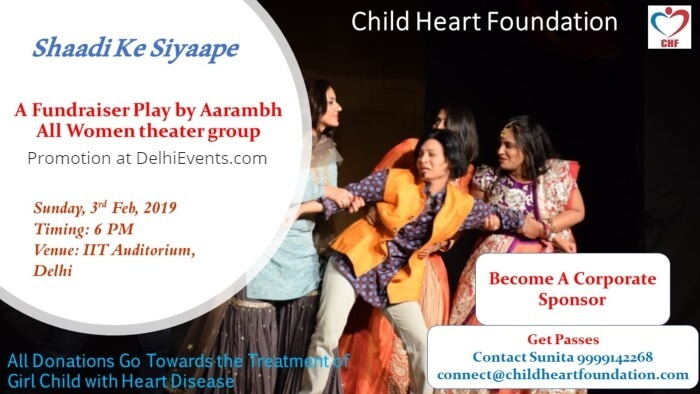 The donations received will be used for the treatment of girl child patient who are diagnosed with congenital heart diseases.The play involves some hilarious moments in marital relationship. About the Artist : Aarambh is a theatre group formed of all female artists who wanted to work for social cause and help in their own way by entertaining and creating awareness for serious issues. They have performed many times earlier and raised funds too. About the Organization : Child Heart Foundation is a registered NGO working for children diagnosed with congenital heart diseases born in underprivileged families. One child in every 100 live births is born with congenital heart defect.So every year 180000 to 200000 children are born every year with these defects and only 15,000 children get treated so lot of work has to be done.As of now we have 43 children registered for treatment.